PermCalc generates permeable pavement design suggestions from supplied data. The PermCalc Permeable Pavements Design Calculator (“Calculator”), owned and operated by Brett Landscaping Limited (“Brett”), is provided at no charge as an online tool to provide permeable pavement calculations and design suggestions. It does not purport to be comprehensive, has not been independently verified and is not a substitute for engineering skill and judgment and in no way replaces the services of a suitable professional, experienced, competent designer or engineer. Final determination of the suitability of any information, calculations and/or design suggestion(s) provided by or in relation to the Calculator for any use contemplated, and the manner of use. is the sole responsibility of the user of the Calculator and its professional advisors, who assumes all risk and liability in connection therewith. The calculation methodology is based upon the information in BS 7533:13: 2009 Pavements constructed with clay, natural stone or concrete pavers Part 13: Guide for the design of permeable pavements constructed with concrete paving blocks and flags, natural stone slabs and setts and clay pavers, published by British Standards Institute. The notes for guidance used within this tool have been taken from the Interpave document ‘Permeable Pavements: Guide to the Design Construction and Maintenance of Concrete Block Permeable Pavements Edition 6’. 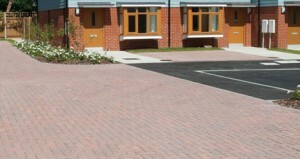 If further clarification of any points is required the complete guidance document can be downloaded at no cost from http://www.paving.org.uk/permeable.php. Information, calculations and/or design suggestion(s) provided by the Calculator, are based on certain assumptions. Whilst Brett uses and has used reasonable efforts to ensure that any information and assumptions relied on and/or contained within the Calculator (including, without limiting the generality of the foregoing, the calculation methodology and guidance notes and the information provided by Interpave and the British Standards Institute, as aforesaid) (together “the Input Materials”) is accurate, up to date and complete, no representations, warranties, conditions or other terms (expressed or implied, statutory or otherwise and in the past, present or future) are or will be made made as to the accuracy, reliability, currency or completeness of the Input Materials, or as to their satisfactory quality or fitness for a specific purpose. Any information, calculations and/or design suggestion(s) provided by or in the course of using the Calculator (Output Materials) are illustrative only and should not be treated as detailed, accurate and complete or be used for commercial or construction purposes without independent verification by a suitable professional, experienced, competent designer or engineer with Professional Indemnity Cover, or as may otherwise be appropriate, first. Whilst the Output Materials are or have been prepared in good faith, no representation, warranty, condition or other terms, express or implied, statutory or otherwise, in the past, present or future, are or will be made in relation to the accuracy, reliability, currency or completeness of the Output Materials, or any other written or oral information made available to you or your advisors in relation to the Calculator and/or Output Materials, or as to their satisfactory quality or fitness for a particular purpose. The use of the Calculator is on an “as is” and “as available” basis. (4)	any representation or statement made on and/or in connection with the Calculator, Input Materials and/or Output Materials. For the avoidance of doubt, under no circumstances shall Brett be liable to a user of the Calculator for any loss or damage suffered (including, without limitation, direct, indirect or consequential losses) arising from the use of, or reliance on, the Calculator, the Input Materials and/or the Output Materials or any other written or oral information made available to users in relation to the Calculator (including downloading of any information). Brett do not exclude or limit its liability for death or personal injury arising from Brett’s negligence, or any fraudulent misrepresentation made by Brett, on and/or in connection with the Calculator. No information set out or referred to in this document, the Calculator, the Input Materials and/or Output Materials shall be relied on or deemed to be an inducement for a user of the Calculator to enter into any further contract(s) with Brett, or any company in the same group of companies as Brett. If a user of the Calculator wishes to purchase goods and/or services from Brett, or any company in the same group of companies as Brett, such purchase will be subject to a separate contract on Brett’s standard terms and conditions of business or as may be otherwise agreed in writing between the parties. For the avoidance of doubt, copyright in the Calculator and Output Materials belongs to Brett . It may not be reproduced in whole or in part without our prior written permission.